IMS Global has proven that leading educational institutions and edtech suppliers can work together to move the education sector forward by creating the innovative products and digital strategy that have the greatest impact on teaching and learning. After 11 years of dramatic growth, IMS Global has become one of the largest and most influential standards consortia in the world. Organizations across K-20 are adopting innovative digital tools that support the evolution to next generation personalized learning. However, it’s a daunting task as the number of digital options is growing rapidly. How do you move from digital tools operating in silos to developing a digital transformation strategy that provides the foundation for students and faculty to easily select and combine the right tools and resources to enable better experiences and better outcomes? IMS Global members are academic and IT leaders from around the world who are leading the revolution to create a more easily integrated, student-centered, accessible, and data-driven ecosystem to support next generation learning. 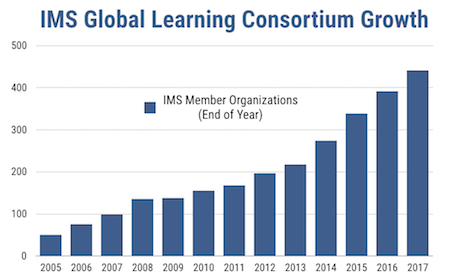 When you join IMS Global Learning Consortium you will leverage the collective investment of over 400 suppliers, institutions, and states (and growing), all working to enable a digital transformation strategy that rapidly advances an educational technology ecosystem where users have better options for digital tools that work together and result in more effective teaching and learning. You simply will not find a larger or more productive collaboration of education IT and academic leaders anywhere in the world.